← New Funko Pop! Walmart Exclusives On The Way! It seems like every day we get a new report of clearance items at Walmart stores throughout the US with ever-decreasing prices. 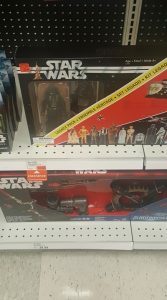 It seems to be a large push of what looks like every Star Wars product in their toy aisles from The Black Series 6″ & 3.75″ to 5POA and everything in between. Is this happening at your local Walmarts? Click through to see some examples. ← Save 20% At HasbroToyShop.com With New Promo Code! Past TBS6 Figures To Return To Retail This Fall? Rumor has it that The Black Series [Phase III] 6″ collectors can expect to see the return of the AT-AT Driver and Snowtrooper in some capacity this Fall. Stay tuned for more. Save 20% At HasbroToyShop.com With New Promo Code! Save 20% RIGHT NOW at HasbroToyShop by using promo code JULYSAVE17 now through July 4th! As you know they still have some great figures in stock. Check it out! This time from ThinkGeek. They sent out an e-mail last night letting customers know that Han Solo has been discontinued. I believe this is just the first of many e-mails ThinkGeek will be sending out. 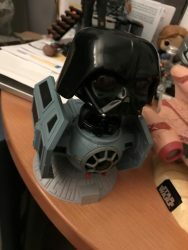 The successful The Black Series [Phase III] First Order Special Forces TIE Fighter 6″ vehicle continues to rear its ugly head and be found for pennies on the dollar on clearance. 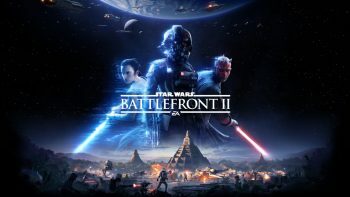 It’s now listed on Walmart.com for a low $74. Check it out if you’re interested.. Special thanks to JTA reader Mark M. for the alert! 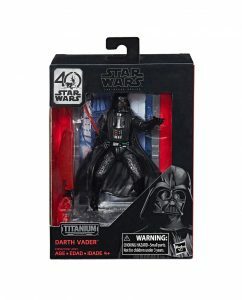 ← Some Walmart Stores Still Getting TBS6 [SW40] Wave 2! JTA reader and Facebook friend Casey M. sends us proof that some unsold Rogue One products have been peddled to ROSS outlet stores. If you’re interested in these it might be worth your while to check out your local ROSS! 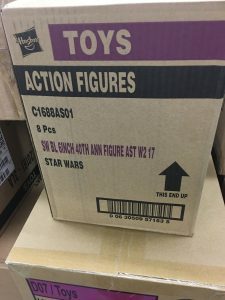 Some Walmart Stores Still Getting TBS6 [SW40] Wave 2! While some Walmart stores are stripping all of their Star Wars figures out of the system, some are putting out The Black Series [Star Wars 40] wave 2. These were found by JTA reader Agustin in Florida. I am curious if these figures even scanned however. It looks like the prices are dropping, albeit rather slowly. Most of them are $14 or a bit under on Amazon currently with Free One-Day Shipping for Prime members. Maybe it’s time to jump, or maybe they’ll drop more. Who Knows? Or, maybe they’ll end up out of production and worth triple the amount and we’ll be left buying from scalpers! 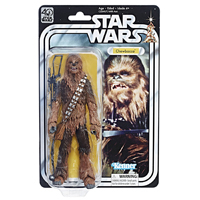 Tags: Amazon, Darth Vader, Han Solo, Luke Skywalker, Obi-Wan Kenobi, The Black Series [Star Wars 40], Titanium Series 3.75"
← ToysRUs.ca Has TBS6 [SW40] In Stock NOW! Hurry, Hurry! The “so-called” cancellation of The Black Series [Star Wars 40] line has gone international! Please click through to read an email from online German retailer ActionFiguren24 which goes on to explain that “any outstanding orders were canceled worldwide“. Leave it to JTA to spread such rumors, huh? (more….) Special thanks to JTA reader Thomas O. for the news and translation! Early Signs Of Concern For TBS6 [SW40] Wave 2 Availability? So it begins…. Online retailer NJTC recently put out a quote with their newsletter which you can see below. Not to mention, all their Wave 1 figures are listed as, “ALMOST GONE! Get them while it’s still possible!” I have been watching Amazon stock flow in and out all day today, even as recently as an hour ago, but will these get filled? Hopefully these are based on the shipments they have on the way. Only time will tell, but I will tell you that if you see them, I would grab them! Funko has revealed their D23 Expo Dorbz Exclusives. 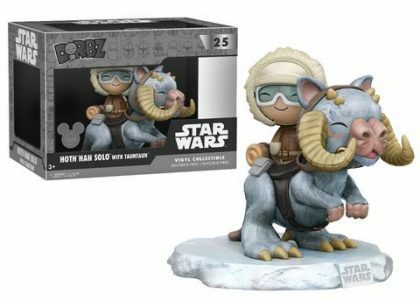 I personally do not collect these, but the Hoth Han looks pretty neat! Check out the rest here! Hurry! 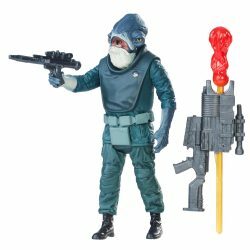 If you’re still looking for Admiral Raddus and Lieutenant Sefla, now’s your chance to get them at retail price. Special thanks to JTA reader Aidan for the news. Everything but the IRG is IN STOCK at Hasbro Toy Shop. Special thanks to JTA reader Matthew for the alert! I asked Matthew H. from Star Wars Black Series 6″ Collectors Facebook page if I could share these images here at JTA. While it’s obviously just a mistake, it’s painful nonetheless because of the rarity these things show up in stock for normal MSRP. Look what he received in place of the two figures he should have received instead. That’s got to be a punch to the gut! BREAKING NEWS! The Black Series [Star Wars 40] 6" Line: It's Done Folks! 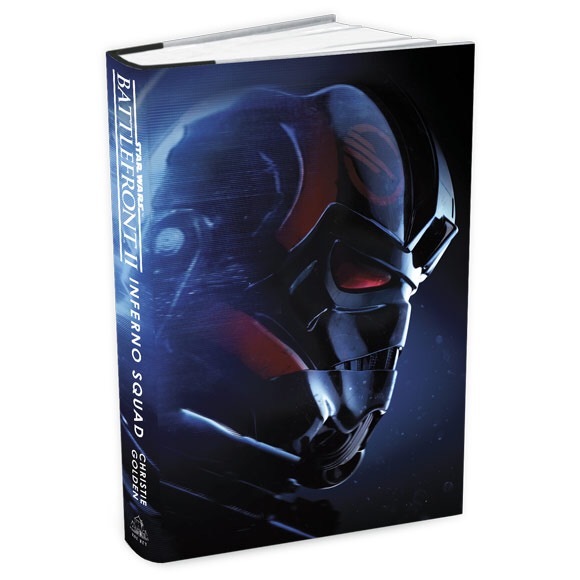 Following the success of the popular SWCO Thrawn exclusive cover, SDCC attendees will get a chance at an exclusive cover version of Inferno Squad. I’m sad I will be missing out on this one! ← More Highly Sought After Figures Scalped By Walmart: Will This Never End? Check out the latest Disney addition to our Visual Guides: BB-8. Click below for our full guide page, and make sure to read our review on this figure right here. 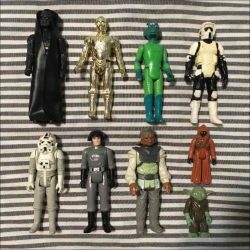 ← UPDATE: 50+ TBS6 Figure Lot SOLD! More Highly Sought After Figures Scalped By Walmart: Will This Never End? The Black Series [Star Wars 40] Artoo-Detoo (R2-D2) just popped in stock at Walmart.com. But there is only one problem: it’s $49.95. This has happened before, but they’re scalping their own stock again. Can anything else go wrong with this line? Thanks to friend Steve U. for the alert! UPDATE: 50+ TBS6 Figure Lot SOLD! Holy crud! Do you remember this auction? It actually sold for $1000! Check out the proof HERE. You may have seen many of his great posts already. Here is his official welcome. Chuck and I are very happy (and relieved) to welcome zealously eager staff member Colin Borden to the JTA team. Colin actually grew up about 15 minutes from where I grew up in NJ so it’s great to have that close connection in addition to our mutual passions for Star Wars (which are pretty different mind you). By the way, his introduction to Star Wars figures was nearly identical to mine as well (see his story). 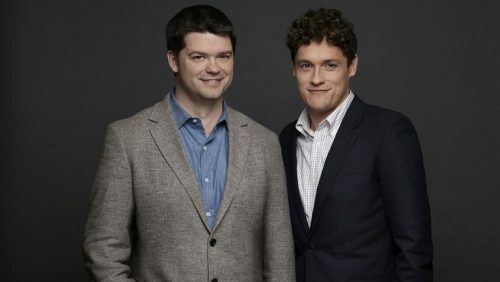 Colin is a tad younger than the other older fogies here and brings a unique perspective on the Disney acquisition of Star Wars, i.e. he doesn’t loathe The Force Awakens like I do. So those who don’t like me (here and on Twitter) be glad Colin is here. Click through for a little background information on Colin and please give him a warm welcome in our comments. Disney Parks is knocking it out the, well, park with their fun Droid Factory line. But after a stellar effort on C1-10P “CHOPPER”, they seemed to have backslid with BB-8. See why this one feels like a rushed job in our Research Droids Reviews today. Be sure to leave your own thoughts in our comments section, vote in the poll or even leave comments about it on our Facebook page. Click the banner below for the direct link to the review! As always, you can also send your own personal review requests via email if you’d like to see something that we didn’t cover yet. In case you weren’t aware, new Forces of Destiny doll images made their way up on Amazon a couple of days ago (only if you dig long enough!) and also the writer of the series, Jennifer Muro, had some interesting things to say on Star Wars most inspiring women. Click through to see more on the images and the interview. 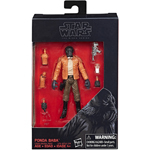 Walmart Exclusive 3.75" Ponda Baba In Stock! Hurry! If you’re still missing this great Ponda Baba figure, now is the time to grab it before it’s gone! ← GameStop.com Is Taking Orders For The Imperial Royal Guard Now! There are apparently a lot of Poe Dameron fans out there and LucasFilm and Marvel felt there was enough there to warrant his own comic series. The series may have a lot of readers, but it isn’t one of my favorites and this one-off Annual didn’t make it much better. That being said, this issue did add a bit of depth to the character we see on screen in The Force Awakens. Check out what I thought about this Annual issue and be sure to check out the other comic Research Droids Reviews. While you’re there, be sure to share your thoughts in the comments. If there is a series you think I should review, be sure to drop me a line and let me know! The official publication date is a few days out yet, but we’re happy to provide you with an early look at the photo gallery and review to Disney Parks’ BB-8 Droid Factory figure. We’re underwhelmed (and it has nothing to do with being a character from The Force Awakens). Find out why. 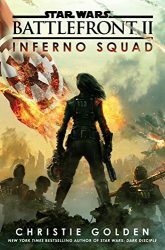 USA Today has an excerpt from the upcoming Battlefront II: Inferno Squad novel. Due out July 25th, you can pre-order this on Amazon right here. Big Bad Toys Store has released their latest newsletter, featuring all of their latest arrivals and new pre-orders. Click through for the details. 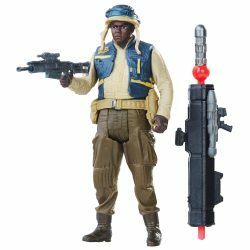 If you’re interested, Hasbro Toy Shop’s eBay store has placed additional items on clearance, like The Black Series [Phase III] Jango Fett 6″figure. It might be worth taking a look.Special thanks to JTA reader Sean C. for the alert! ← Talk About A Sweet Deal! Now Wouldn't It Be Great If This Could Be Used For Star Wars Products? 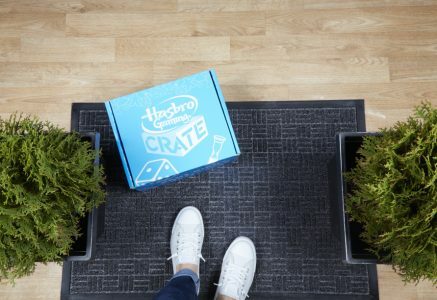 Hasbro recently launched a new subscription service called “Hasbro Gaming Crate” and ships a themed crate of three games to the subscribers house every three months. I don’t know about you, but how great would it be if you didn’t have to struggle to find every figure and they just showed up at your door step? Click through to read on. ← Where Should Hasbro Focus Their Efforts For The TBS6 Line? It may not be what you expected, but hey it could be a great gift for that Star Wars fan in your life. Heck, my Mother was so excited about it that she e-mailed me it! Plus, 75% off of some Darth Vader chocolate is always a good thing and that awesome Darth Maul&M dispenser is pretty sweet (get it?). Am I right? Where Should Hasbro Focus Their Efforts For The TBS6 Line? 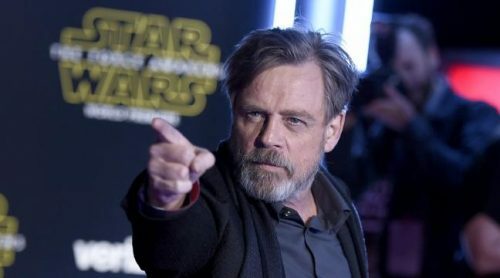 Mark Hamill generated a lot of conversation after he stated that he fundamentally disagreed with The Last Jedi director Rian Johsnon about direction of Luke’s story. Variety caught up Hamill at the Tony Awards and he clarified his recent comments. Hamill said, “I got in trouble, because I was quoted as saying to Rian that I fundamentally disagree with everything you decided about Luke, and it was inartfully phrased. What I was, was surprised at how he saw Luke. And it took me a while to get around to his way of thinking, but once I was there it was a thrilling experience.” Check out the full video! ← Disney Parks BB-8 Droid Factory Figure Loose Images! We’re a little late to the party with this news, but I still think it is worth sharing. 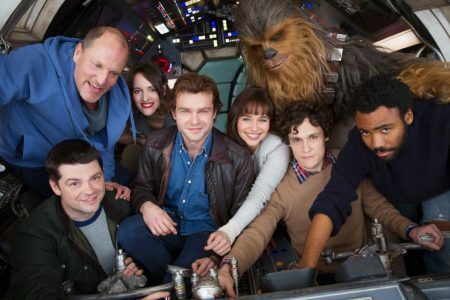 MakingStarWars.net recently obtained pictures of the crew shirts from the upcoming Han Solo film. 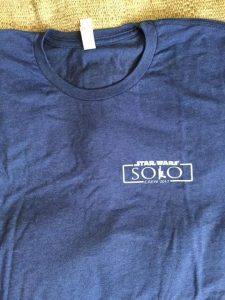 The shirts reveal what may very well be the working title and logo for the film, Star Wars: Solo with Han’s signature blaster standing in for the “L.” What do you think about the potential title and logo? What about the film as a whole? Despite the talented directors and cast, I’m still concerned. Head over to MakingStarWars.net to check out the full gallery! Disney Parks BB-8 Droid Factory Figure Loose Images! Through a combined effort of friends Mario M. and Josh M., we’re able to provide some close-up images of the new Disney Parks Droid Factory BB-8 figure. She how Disney approached this figure, it’s pretty cool! The last image has been Photoshopped to correct the deco on the character’s main eye. Check them out! 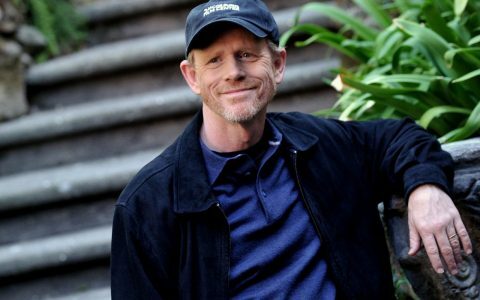 A fired Lucasfilm, LTD. employee leaks important The Last Jedi plot details in his disgruntlement. ibtimes.co has the details! Spoilers apply big time! 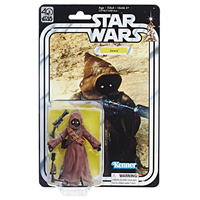 ← Loose Ponda Baba 3.75" Figures 62% Sold Out! 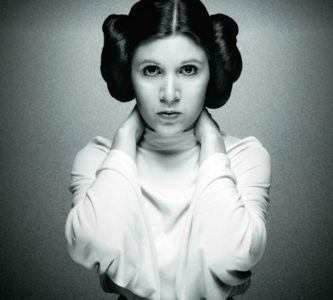 Drugs, including heroin and cocaine, were found in Carrie’s body during her autopsy. USA Today has the full (and very upsetting) story. 3.75" BB-8 Hits Disney Parks! 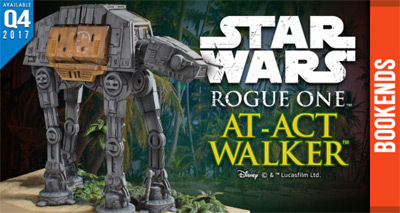 Look what new figure has just hit Disney Parks today! JTA friend Mario M. has found the new BB-8 figure in California this morning at his local Disney theme park! As you recall, this figure was revealed at SWCO this past April. Are You Attending SDCC This Year? You are? Well, how much do you enjoy standing in lines? Lines, lines, lines, and more lines! Star Wars Celebration is the same way. If you want exclusives, let’s face it, you’ll be in a line most of the day. Wouldn’t it be great if there was another way? Well, there is and I think it is time that everyone gets on board. Click through to see how to quell the queue madness. 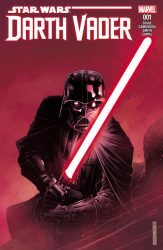 Recently, I shared my review on the new Marvel Darth Vader comic which is written by Charles Soule. I thought it was a fantastic start to a new series that explores an area of Darth Vader we have yet to see and are eager to see; his first steps as the mechanical, maniacal apprentice of Emperor Palpatine. In a recent interview with Marvel.com, Charles shared his thoughts on the Emperor, Darth Vader, and where this comic series is going. Award winning ethical footwear label and pioneer, Po-Zu launch AW17 Mainline & Star Wars™ | Po-Zu AW17, is Offering a fresh look and feel to the signature Po-Zu range. The AW17 collection blends comfort and style with sustainable materials and the classic ethos of the brand. Click through for the full press release. ← Baze And Chirrut Making An Appearance? 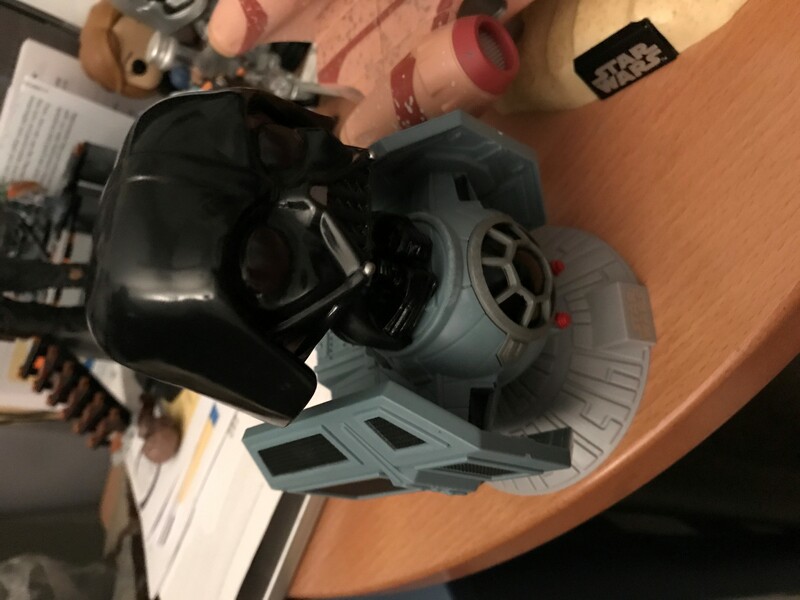 Target Exclusive Darth Vader In TIE Fighter Pop! JTA reader Ken reports that Targets in AZ are starting to receive these exclusive Pops!. Each Target received only 4 so these may be scarce for awhile. They’ll probably be making their way around the rest of the US this weekend, so be on the lookout because you’ll never know what you’ll find. I stumbled across a Rey with speeder Pop! at Walmart the other day. Ken was also kind enough to provide the DCPI 323-01-0569. Good luck! Baze And Chirrut Making An Appearance? The Baze and Chirrut TBS 6″ figures may arguably be some of the most difficult to find. The fact that they were single packed in a case with 4 carry overs did NOT make it easy for people to find them. Heck, I STILL haven’t seen them in a store and I only have them because I got lucky on Amazon early on. Good news may be on the horizon for those still searching for these retired Guardians of the Whills. JTA reader Anthony reports that his Entertainment Earth April pre-orders are due to ship out Monday. Hopefully that means more solid cases are making the rounds. Might be time to get your orders in from EE! Need we say more? Be sure to go and check it out at ABC News. 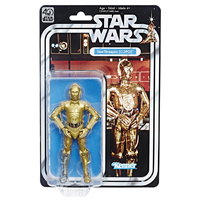 Solid Case Packed Artoo-Detoo (R2-D2) And Han Solo: Pre-order Now! The solid case packs have gone up for pre-order at Entertainment Earth for two hard to find The Black Series [Star Wars 40] figures. pore-order as many Artoo-Detoo (R2-D2) and Han Solo figures as you’d like and KILL that aftermarket folks! Special thanks to JTA reader Craig P. for the alert! 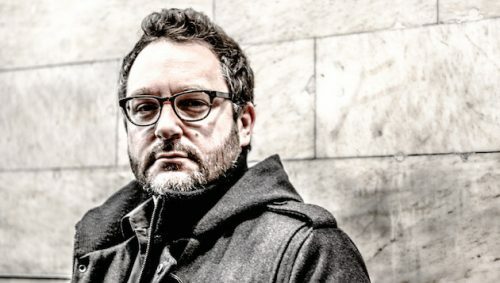 The Hollywood Reporter has posted an article which ushers in concern for Star Wars Episode IX based on director Colin Trevorrow’s critically panned The Book of Henry. Apparently the film is so bad that the critics couldn’t stop laughing. And we know how disastrous the Jurassic World reboot film was. Should Star Wars fans be concerned about this latest installment in the series? This quote is especially disconcerting: “And the compounding coincidences he requires in order to deliver a happy ending are almost disgustingly dishonest.” Although, this is exactly what TFA brought us so it might be the perfect marriage here. No comment from this peanut gallery, but special thanks to our friends at BanthaSkull.com for alerting us to this interesting Friday story. 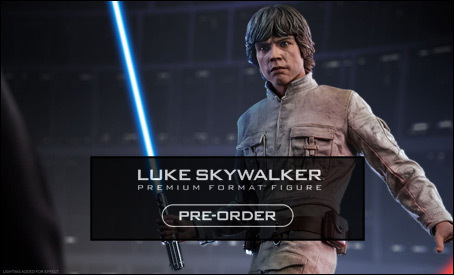 Sideshow Collectibles has their Luke Skywalker (Bespin Fatigues) Premium Format figure up for pre-order. Click here for the exclusive version. 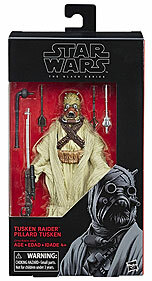 ← tunghori Relists Latest Walmart Exclusive Wave Again! ← Some New Star Wars Adventures Are On The Way! tunghori Relists Latest Walmart Exclusive Wave Again! They sell out in moments when they go in stock at Walmart online. HURRY if you still need them or want them. 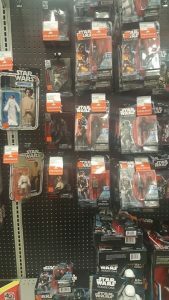 eBayer tunghori lists the Walmart exclusives latest wave of super-articulated 3.75″ Star Wars figures again! Special thanks to JTA reader Craig P. for the alert! Some New Star Wars Adventures Are On The Way! The brand new Star Wars comic being released by IDW Publishing is slated to be released on Sept. 6. ComicBookResources has been given an exclusive first look at this new comic titled Star Wars Adventures. You can be sure I will be reviewing this when it arrives, but for now come along as we take a look at what this new comic will be about.. If you’re still looking to grab the Jedha Revolt 4-pack, Amazon has them listed at $17.99. Or if you prefer, Walmart has it for $18.75. I will say, it is a nice little 4-pack especially with the inclusion of Saw. So if you’ve been waiting, it may be time to pull the trigger. Special thanks to JTA reader Logan for bringing this to our attention! 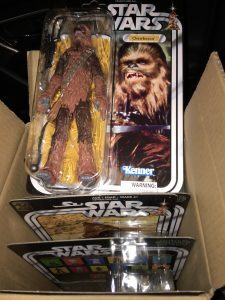 JTA Reader Danny sends us some images of his latest order of 40th Anniversary figures from Walmart.ca. 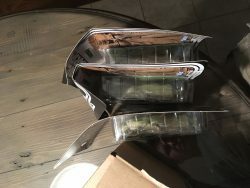 And i thought I got some bad packaging! 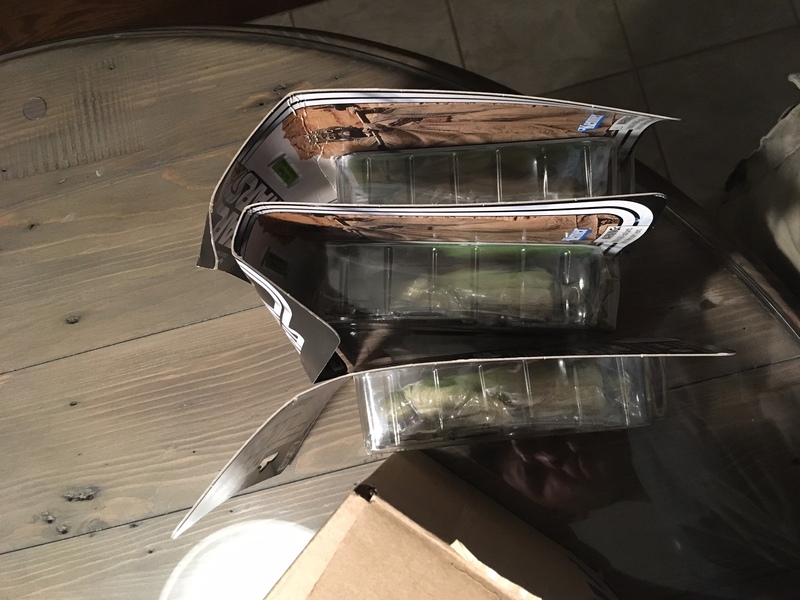 Has anyone else received some horrible packaging like this from Walmart.ca? SPOILER WARNING: An Official Look At Some Troops From TLJ! We recently shared a look at some concept art from The Last Jedi, and while some of you may have argued that they were “a nice fanfic with a fake approval stamp” on it, we now have an OFFICIAL look at some of these concepts. Come on in…if you dare! 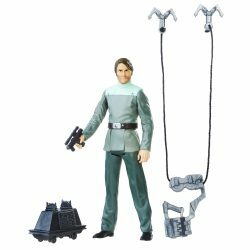 ← Cheap Deals On HasbroToyShop.com Too! You want to see how her new legs look? We alerted you to Amazon updating their product page for the long-awaited and highly anticipated The Black Series [Phase III] Hera Syndulla (42) figure back in May. Now they’ve added new images of the revised figure to that product page. Check it out! 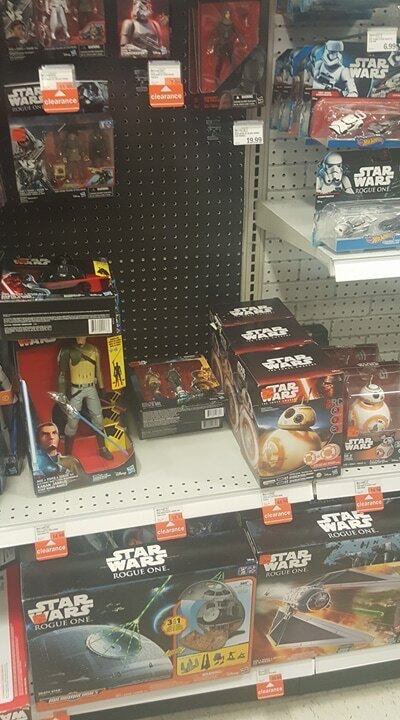 ← Once Again, Walmart Exclusives Back In Stock! The single-packed BB-8 12-Inch Figure has been repainted and comes with different accessories when compared to the TARGET exclusive version (from the three-pack). See what’s different in our Research Droids Reviews today. Be sure to leave your own thoughts in our comments section, vote in the poll or even leave comments about it on our Facebook page. Click the banner below for the direct link to the review! As always, you can also send your own personal review requests via email if you’d like to see something that we didn’t cover yet. Once Again, Walmart Exclusives Back In Stock! 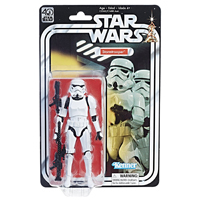 ← UPDATE: Walmart 3.75" Exclusives Back Again! Kenner Focused Ideas For TVC's Return - Make The Most Of It, Hasbro! There are ten (10) specific things I have been obsessing about that I want to see get done when the return of The Vintage Collection comes this Spring 2018. (A lot of it has to do with the original Kenner line.) While it would be wise for all of us to not count our chickens before they hatch, TVC’s return is likely to be a scaled down version of what we encountered between 2010 through parts of 2013. However, there is no reason why Hasbro can’t make most of their existing tooling budgets, parking lots, checklists and brainstorming to help us complete modern releases of the figures we grew up with as kids. Doing this will benefit everyone involved in the Hasbro/collecting community universe. While this unofficial Top 10 list of mine is really “all over the place’ with regards to what it covers, you will notice that it hones in on one repeated topic: getting those original “Collect All 92” out/completed in this line and offers suggestions on how to do it. Please click through and be sure to leave your own two cents in our comments. We have to keep the conversations going about The Vintage Collection. It’s the most important thing Hasbro has done for us in over half a decade. UPDATE: Walmart 3.75" Exclusives Back Again! UPDATE: A New Hopeful Update For Fenn Rau? JTA regular Mark directs our attention to an interesting turn of events on a much wanted action figure. 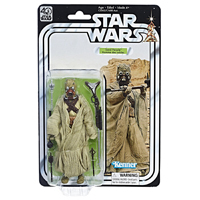 The elusive Rogue One (Star Wars: Rebels) Fenn Rau that once showed as “This item is no longer available” has just changed its status online at Walmart to “Coming Soon”. As you know, we CANNOT get a straight answer on this figure from official sources. Can this product page update serve as any glimmer of hope, a sign or guarantee that it’s still coming? Probably not, but we still believe that this currently hard-to-find figure will see future better availability – we just don’t know when exactly. UPDATE: It DID say “Coming Soon” earlier (see attached screen shot as evidence), but it’s now showing as “No Longer Available”. I guess our hope is shot down now. We found a couple of new exclusives at TARGET today including this adorable Tusken Raider And Bantha Galactic Plushies set for $29.99. We had to walk away because it almost ended up in our cart. There was also a new Hasbro role play set which we forgot the name of already, but it was $49.99. UPDATE: Only Tusken Raider Left. 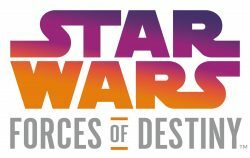 Our friends at Yakface.com have intercepted new DPCI info from TARGET employees of upcoming TBS6 products (including approximate release dates and prices) and Forces of Destiny products. Check it out. Free shipping on orders of $25 or more at Brian’s Toys. Get all the details in this week’s newsletter. 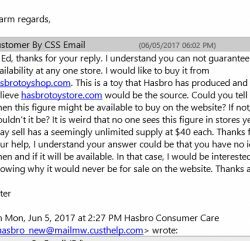 When we report things that Hasbro directly say to us at conventions as tidbits of new information or confirmation, the doubt that still remains within the collecting community perplexes us. JTA reader Paul G. sends us proof of what unequivocally MUST BE multiple solid case packs of Qui-Gon Jinn. Maybe Amazon didn’t get them yet because they’re showing up at ThinkGeek stores instead. 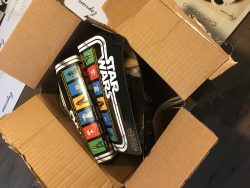 We don’t know as that’s just a guess, but the takeaway here is that Hasbro was completely right that ALL The Black Series 6″ figures going forward will be available in solid case packs (until that directive changes). Case closed, no pun intended RFG. Click through for more information. 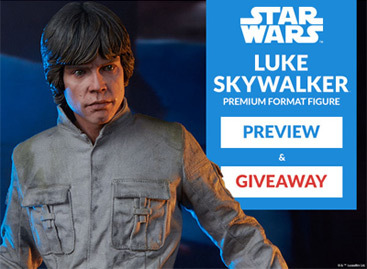 Check out the Sideshow Collectibles Premium Format Luke Skywalker (Bespin Fatigues) preview. You can also register for a chance to win one. This will go up for pre-sale on June 15th. Click here to have a look. ← Disney Store Has An Amazing Sale Happening! 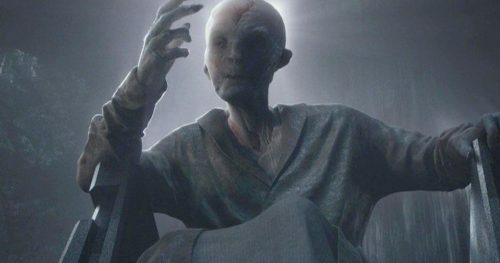 There are some Concept Art Designs from The Last Jedi making there way around the web. The Templo Jedi Aztlan Facebook page received some interesting images showing some designs and concepts for some characters from the film. I will say these images are not too spoilerific, but they are things we’ve not seen yet so you have been warned! Come on in.. if you dare. UPDATE: Added another image for clarification purposes. ← You Call That Customer Service?! 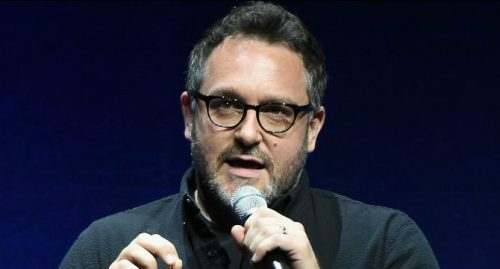 In a discussion with CinemaBlend, Episode IX director Colin Trevorrow talked about the process of creating the next chapter in the Star Wars saga without Carrie Fisher. Although Trevorrow’s comments weren’t particularly revealing, he did admit that his options are limited because there are only certain things they are willing to do. Lucasfilm already ruled out using a CGI recreation to continue Leia’s story without Carrie Fisher, which is a wise choice. 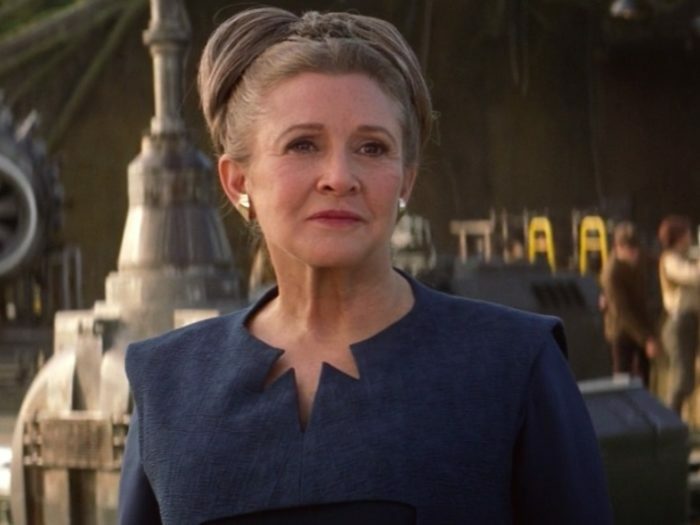 How the creative team will honor Carrie Fisher and handle Leia’s story is what I am the most anxious about heading into The Last Jedi and Episode IX. What do you think? Click through to read the full quote from Trevorrow. You Call That Customer Service?! Check out the correspondence chain JTA reader Peter V. received from Hasbro customer service regarding his plight trying to find Fenn Rau from the Rogue One line. Click the thumbnail below for more. 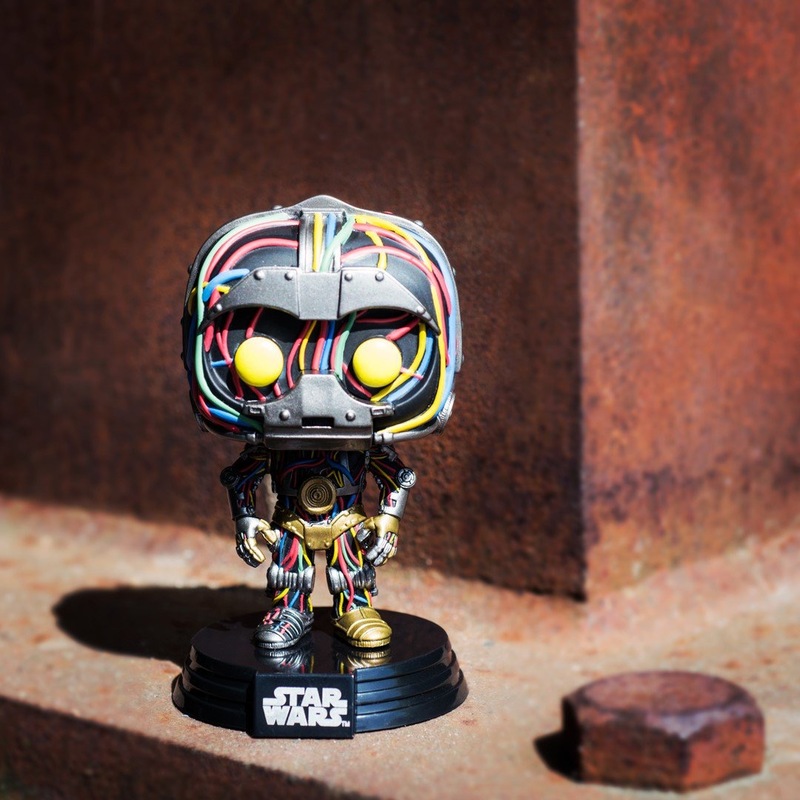 JTA reader sends us an image of at least one of the contents in the next Smuggler’s Bounty Box from Funko: an Episode I version of C-3PO! JTA sponsor Big Bad Toy Store checks in with their latest newsletter, featuring all of their new pre-orders and new arrivals. What’s the deal with Fenn Rau? You can’t really find him cheaper than $40 on eBay. And so far in the USA he’s the sole figure in the last Rogue One wave that hasn’t been offered as a solid case pack. We have reached out to Hasbro TWICE about this figure and as of this post have received no answer regarding his status. It’s almost as if they don’t mind that you pay this much for him. My gut is that he will be carried forward into The Last Jedi line (by their non-response), but I don’t have complete confidence on that. If you click below, you will see the desperation for this figure as so many have no qualms about paying this much per figure. Special thanks to JTA reader Gman G. for alerting us to this obscene auction on eBay. ← You Think Hasbro Has Deco Problems? Look At THESE Knockoffs! Hey Canadian collectors! The Black Series [Phase III] First Order Special Forces TIE Fighter is on sale at ToysRUs.ca for $76.98. Special thanks to JTA reader Jean C. for the news!. TBS6 [P3] Wave 11 Inventory Too Good To Be True? Well, as much as I had hoped Amazon was taking notes on their previous overselling of pre-orders, it seems we’re starting to see some of the same issues. We have been lucky to see a steady flow of stock on Amazon, but some of our readers have reported receiving delay notifications on their orders. Have you experienced something similar or is this an isolated incident? Thanks to JTA reader Agustín for the news. 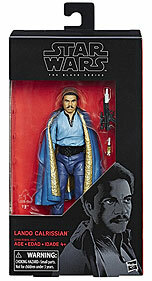 ← TBS6 Wave 11 In Stock On Amazon... But Going Fast! The Captain Cassian Andor (Jedha) 12-Inch Figure from the Rogue One line is decent, but we wonder if any of you will even care. Check it out in our Research Droids Reviews today. Be sure to leave your own thoughts in our comments section, vote in the poll or even leave comments about it on our Facebook page. Click the banner below for the direct link to the review! As always, you can also send your own personal review requests via email if you’d like to see something that we didn’t cover yet. Wow, this one almost bypassed us! We don’t hang out on social media so we don’t know how many people out there are finding this, but it appears that the Darth Revan wave is making its way to Walmart. 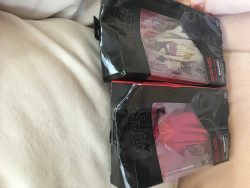 JTA reader and friend CS E. saw a bump in his local Walmart inventory of The Black Series [Phase III] figures so he went to check out what the store got. What he found was the Darth Revan wave. (The Darth Revan included was the new one though (cape tuck)). The AT-AT Driver was also the Driver and not Pilot. So this is clearly a new-old case. And they were 9.84… not bad. It looks like this wave might fall under “too much too late”. Sad. Be sure to let us know if you’re finally finding this wave at your local Walmart. This may be one of the few store reports that this wave is hitting there. I haven’t heard otherwise. 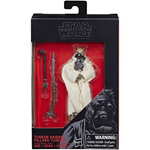 ← Walmart Exclusive TBS 3.75" Figures Toggling In And Out Of Stock! 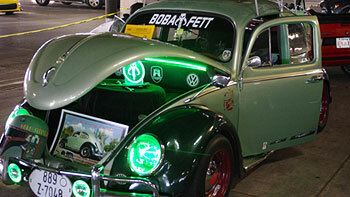 JTA regular Martin M. is about as big a Volkswagen Bug fan as he is a Star Wars fan so he went out of his gourd when he went to a VW car show locally in Texas and discovered a Boba Fett themed VW. He asked to share the splendor with the rest of our readers. Click through for the full gallery! Thanks Martin! Walmart Exclusive TBS 3.75" Figures Toggling In And Out Of Stock! 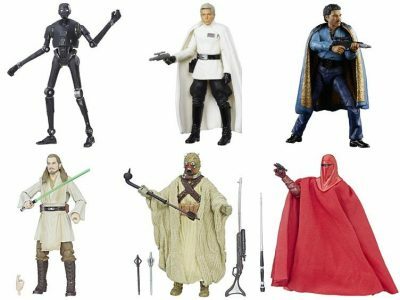 The Black Series [Phase III] 3.75″ super-articulated figures are toggling in and out of stock again. You can stalk Tusken Raider, Ponda Baba, Boba Fett (Prototype Armor) and Sandtrooper to see if you’re lucky enough to grab any of them. As a reminder, you can see all of these figures now currently archived in our Research Droids Reviews. The Shoretrooper 12-Inch Figure from the Rogue One line is nice, but we wonder if any of you will see it at retail. (We hope you will because it’s nice.) Check it out in our Research Droids Reviews today. Be sure to leave your own thoughts in our comments section, vote in the poll or even leave comments about it on our Facebook page. Click the banner below for the direct link to the review! As always, you can also send your own personal review requests via email if you’d like to see something that we didn’t cover yet. If you recall, we informally polled our readers asking what currently existing 3.75″ super-articulated action figures they’d like to see re-released or added for the very first time to The Vintage Collection when it returns this Spring 2018. These figures would receive NO UPDATES or REFRESHES as they would be STRAIGHT REPACKS. (We’ll get to easy retools/kit-bashes at another time.) Now we’ve loosely compiled the results and came up with a solid list of 125 frequently requested characters. Click through for more…. ← Is TFA The New SW [TPM 3D]? This is really nothing new, but WOW! It would do Hasbro good to re-release so many figures that were part of the Comic Packs line, especially those from the red phase of the Legacy Collection. They would make lovely additions to The Vintage Collection next Spring. Check out the prices for the Ulic Qel-Droma/Exar Kun two-pack on eBay! My TRU May Not Have New TBS Waves, But..
At least they are carrying these super awesome 40th Anniversary plastic cups that are useful for drinking a huge cup of “Why haven’t you moved out those Hovertank Pilots” tea. My local TRU in NJ has only received the Legacy pack, die-cast (once), and these awesome cups. 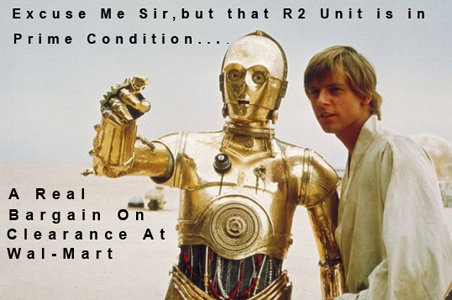 One can only hope they get this fixed before “Force Friday” later this year. What does your TRU store look like lately? DK Books is giving away a signed copy of Rogue One: The Ultimate Visual Guide. Click here to enter! Brian’s Toys has posted thier latest newsletter. Get all the details after the jump! What Is That Place Where That One Guy Was From? There is a magical place we all go when we we’re looking for answers. No, I don’t mean church, your dreams, not even television or the movies. 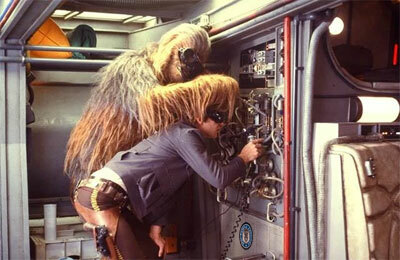 The place I’m talking about is that wonderful place we call Wookiepedia. i09 recently spoke with two of the editors about how they take all the (what seems like endless) Star Wars knowledge and put it in a nice, neat package for us to search. Come and open this Holocron. 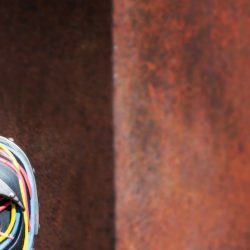 ← When New Technology Goes Wrong: Do You "See" It? IMPORTANT: if you utilize our RSS function, please be sure to update your link. Our new link is http://www.jeditemplearchives.com/feed/. When New Technology Goes Wrong: Do You "See" It? 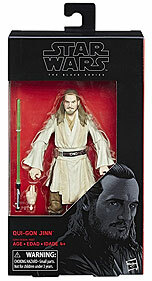 It look like something rather IMPORTANT is missing from JTA reader Ray M.’s latest The Black Series [Phase III] Qui-Gon Jinn (40) acquisition from ThinkGeek in Humble TX, which is just northeast of Houston. Can you guess what it is? We’ll let Hasbro slide here. This is new technology that we hope only gets better with time. What eyes you have! Or is it “what eyes do you have”? ← Real Or Not Real, That Is The Question! My recent order from HasbroToyShop came so very very fast, even with standard shipping. This is how they showed up. No packaging material to protect them. No bubble pillows or even wrapped up paper. What a shame. Hope everyone else has better luck! 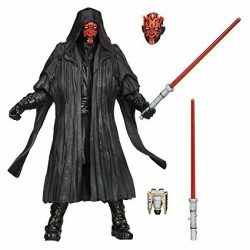 Darth Revan has been removed from Hasbro Toy Shop. This is a strange occurrence. Click the image below to see the proof. Special thanks to JTA readers James S. for the alert! Hurry! If you’re still looking for these, now’s your chance to get them at retail price. Special thanks to Agustin for the news. It’s now time to check out the Imperial TIE Fighter from The Legacy Collection. See it in our Research Droids Reviews today. Be sure to leave your own thoughts in our comments section, vote in the poll or even leave comments about it on our Facebook page. Click the banner below for the direct link to the review! As always, you can also send your own personal review requests via email if you’d like to see something that we didn’t cover yet. ← Funko Pop! 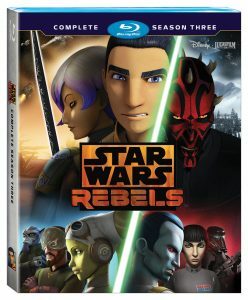 Seventh Sister IN STOCK At Walmart.com! Forget about maintaining exclusive rights to any part of the Hasbro Star Wars line, Walmart, this great retail partner of Hasbro’s, shouldn’t even be allowed to carry Star Wars figures. Special thanks to an anonymous reader who asked us to share this image. Funko Pop! 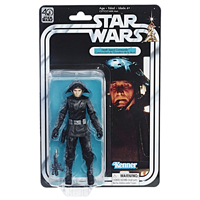 Seventh Sister IN STOCK At Walmart.com! 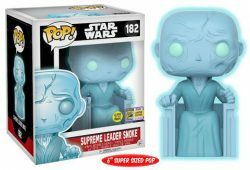 The hard to locate 7th Sister Pop! Vinyl figure is IN STOCK at Walmart.com. Special thanks to JTA reader Kyle for the alert! 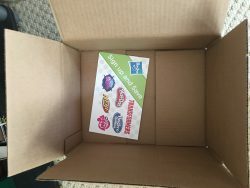 Check out the latest Big Bad Toy Store Newsletter after the jump! It’s been difficult for Star Wars fans to accept the loss of Carrie Fisher, but now her home and over 1,500 personal items that belonged to Carrie and her mother Debbie are being auctioned off. 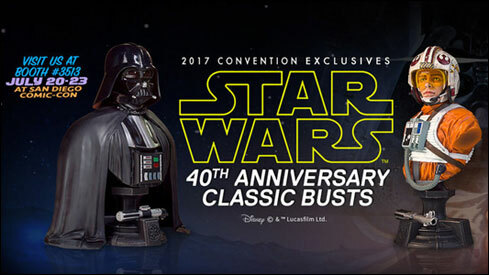 This may be a once in a lifetime chance to get some one-of-a-kind items that would be the envy of many collectors across the globe including a life-size C-3PO and bronze Yoda statue. You can read more about the auction in USA Today..
HasbroToyShop.com is already shipping the orders from this morning for The Black Series 6″ [Phase III] Wave 11. Some will be arriving as soon as Tomorrow! Keep an eye out! Hurry! 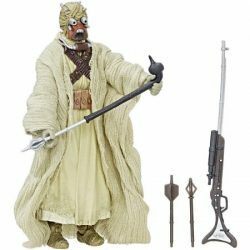 Amazon has Tusken Raider in stock now. IRG was in stock for less than 30 seconds. Update: Out of Stock. HOWEVER, IRG, Qui-Gon, Lando, and Tusken are popping in and out frequently so keep checking and try using 1-click to snag them fast! Once again, thank you for another incredible year checking out our FlashBack Reviews, a subset of our Research Droids Reviews. We’ve just celebrated our 8th year of RDRs and to date we have accumulated 15.5 million views. As a reminder, FlashBack Reviews are really just a “fancy” way for JTA to let our readers know that we’re updating our photo galleries and the review content like the Collector Notes (and so forth) on the best (and sometimes worst) Star Wars collectibles money can buy. FlashBack Reviews will be “closed” from June through August, returning on September 1st 2017 when we will focus on the incredible toys from The Vintage Collection (for obvious reasons). It’s time to get into TVC mode! So be sure to check out FlashBack Reviews again when it returns this September 1st! Please note this will have no effect on our Research Droids Reviews column. Catch our latest FlashBack Reviews HERE. ← Pre-order TBS [P3] Imperial Royal Guard From Dorkside Toys! Dorkside TBS6 [P3] Wave 11 Case + Free Shipping! Dorkside Toys has the entire The Black Series [Phase III] Wave 11 case up for pre-order with Free Shipping! 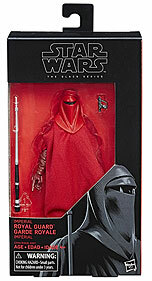 ← TBS6 Imperial Royal Guard IN STOCK At Hasbro Toy Shop! It’s time to check out Darth Vader’s TIE Advanced x1 Starfighter from The Legacy Collection. See it in our Research Droids Reviews today. Be sure to leave your own thoughts in our comments section, vote in the poll or even leave comments about it on our Facebook page. Click the banner below for the direct link to the review! As always, you can also send your own personal review requests via email if you’d like to see something that we didn’t cover yet. 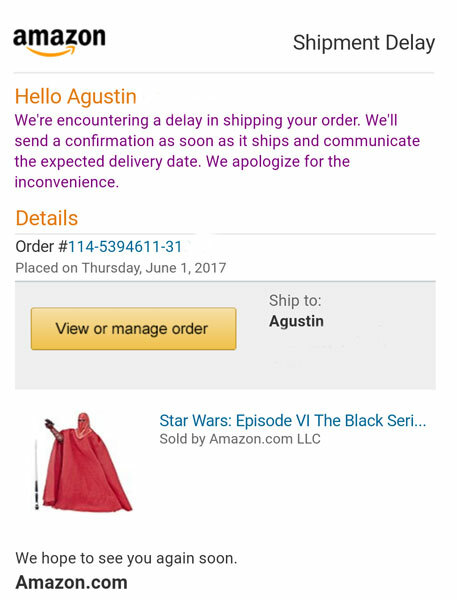 Some folks who pre-ordered the TBS 40th Anniversary figures from Amazon back in February are still getting delayed shipping notices, this time with no estimated delivery date. I’d recommend keeping those orders while you still hunt for them else ware. Hopefully, they will eventually fill them all! Thanks for the alert Donald! bigbadtoystore.com has full cases of wave 11 up for pre-order here. 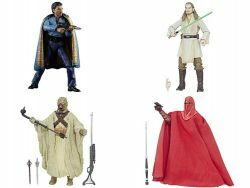 Or if you don’t want K-2SO and Krennic, you can order a set of Qui-Gon, Lando, Imperial Royal Guard, and Tusken Raider here. Or click the images below. Thanks to Erik for the news! If the front page looks a little barren right now, that’s normal! We are making a nuts and bolts transition with our news so it may take a few days for the front page to repopulate. If you are looking for recent articles or discussions you will find them right here in our May archives. If you see anything a little out of whack over the next few days or weeks we may be still doing some behind the scenes tweaking. Thanks for your patience!